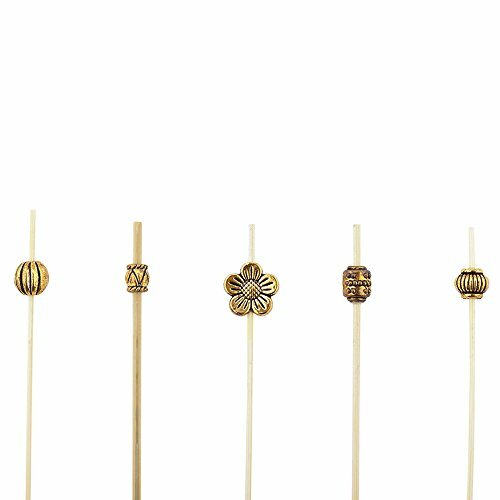 Luxury Gold Metal Beaded Picks - Skewers - 4'' - 1000ct Box - Restaurantware by Restaurantware at Marion Street Deli & Pub. MPN: RWB0276. Hurry! Limited time offer. Offer valid only while supplies last. Made from sustainable bamboo, these durable, strong and nature-friendly 4-inch skewers are perfect for piercing and serving most bite-sized morsels. Made from sustainable bamboo, these durable, strong and nature-friendly 4-inch skewers are perfect for piercing and serving most bite-sized morsels. Their delicately designed gold metal beaded ends add a stylish touch while making it easy and convenient for customers to handle. Whether it's cheese, strawberries, plum tomatoes, olives, shrimp, cuts of steak, or any other savory appetizer, these small bamboo skewers are the ideal choice for parties, galas and catered events. They also make for great sandwich holders, fruit skewers, and toothpicks. These Luxury Gold Metal Beaded Picks are 4 inches in length, and are shipped in bulk in a 1,000 count box. STYLE AND CONVENIENCE: Designed with a gold beaded end for easy use. FUNCTIONAL: These picks are great for serving cheeses, olives, shrimp, strawberries, cuts of meat, and many other bite-sized morsels. VERSATILE: Perfect for bakeries, cafes, hotels, catered events, restaurants, bars and bistros. ECO-FRIENDLY: These biodegradable and disposable stirrers are made from sustainable bamboo. SOLD IN BULK: These gold beaded picks are shipped in a 1000 count box.